DIRECTV’s Investor Day can be a mixed bag for techies. After all the point is to impress the financial types and anything we tend to get will just be table scraps. However, if you really look at what was said, there are a few really juicy bits, some things that weren’t really fleshed out but could provide some hints to where things are going in the coming year. 4K was mentioned early on, and then mentioned again. DIRECTV has given some hints that 4K is in the works and they mentioned that they had a 4K demo “in the other room.” It’s safe to say that DIRECTV will be offering 4K programming, as soon as there is some to offer. They have two satellites under construction and this should give them plenty of capacity. We could see a big presentation at CES, with a TV partner like they did for 3D. Remember that DIRECTV found a way to do 1080P and 3D with existing hardware, and it’s a fair bet that the Genie can do 4K and we don’t even realize it yet. These two words appeared on one slide as being “upcoming technology.” The only question is, what are they? There have been rumors for over a year that DIRECTV will have some sort of technology that would allow you to start almost any program from the beginning, even if you come in late. It’s hard to know how this would work but if you were to think of what “Startover/Lookback” could mean, that fits the bill. Whatever it is, it seems like it’s definitely coming. 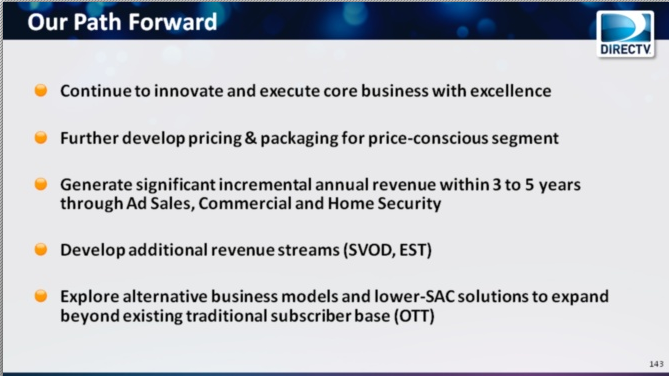 This slide says “expand beyond existing subscriber base (OTT)” — as you all know, OTT stands for over-the-top, meaning internet-delivered TV content. Could DIRECTV be tipping its hand here? There have been multiple rumors lately that DIRECTV plans to offer an OTT service to compete with Netflix and Hulu. DISH has already had one package on the Roku box for over 18 months. Could DIRECTV be moving in this direction? It seems like it might not happen in 2014 but in the years after that… maybe. Some customer service reps let slip last year that DIRECTV was planning an “all-you-can-eat” pricing model for On Demand that would let customers pay one price for unlimited movie streaming. The rumors petered out and CSRs stopped mentioning it. Could we see a return to this idea? The slide above mentions “SVOD” and that term was dropped several times. SVOD is the industry term for what Netflix does, essentially one price for unlimited movies. This seems like a strong hint that Netflix-like pricing is back on the table. Even at $25 a month or more, the ability to see first-run movies several months before they hit Netflix streaming would be a hit. The term “lower cost box” was used several times by Mike White. Surely he means a receiver or DVR that costs less to make, not necessarily one that costs less to the consumer. However, with DIRECTV’s Protection Plan now allowing for a free receiver upgrade every two years, it is important to control costs. Traditionally DIRECTV has controlled costs by hiring lower-cost manufacturers like Technicolor, but occasionally they have cut features from boxes, such as when the HR21 cut out the antenna input to control costs. No doubt that something is coming but what could it be? What do you all think? Everything that is said on Investor Day is fair game, and surely seasoned veterans like Messrs. White and Doyle know that if they say something even quickly, someone will pick up on it. So will these rumors end up to be true?